Impulse sealers are inexpensive, easy to use, and can seal bags of most varieties. These machines run a limited impulse of electricity through a heat element which fuses and seals the bag. The heating process takes no more than a few seconds. 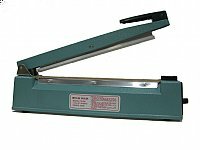 The seal of an impulse sealer tends to be fairly thin, yet durable. This impulse sealer can be used for any thermoplastic material including polyethylene, polypropylene laminations containing foils, such as coffee packages. Setup is an extremely simple procedure. Just plug in the sealer and set the sealing time knob to level one. Put in a bag and test. If not sealed properly set the timer to the next level. Repeat until you are satisfied with the seal. The thicker the bag, the higher the timer number. This sealer comes with a kit of spare heating elements.